Snap Trade Pro is the all-in-one application for heavy equipment sales teams to communicate sales activity, consistently, at scale—in or out of the office, instantly on their devices. Leverage mobile and web technology developed by people with over 28 years in heavy equipment sales. Each industry has unique types of equipment. 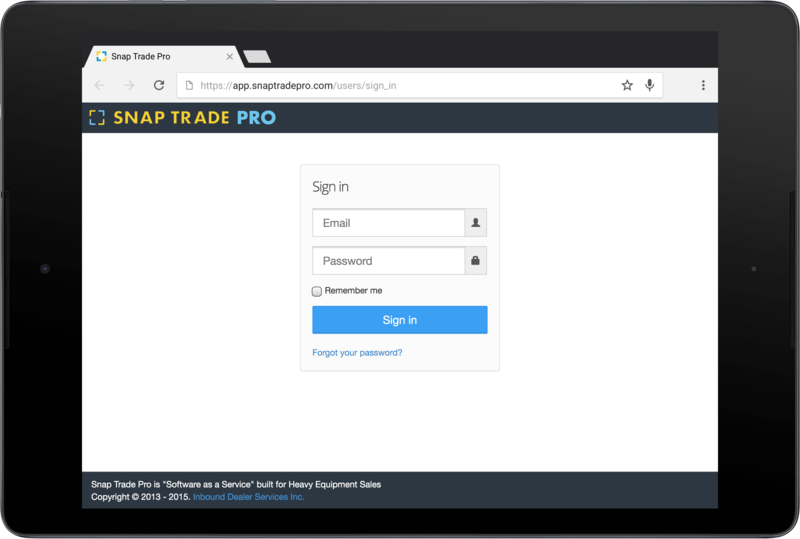 Snap Trade Pro is built to handle those by allowing you to have multiple custom templates for each equipment type. Each Template is constructed of unique Categories which include common fields used to describe and display the specifications, or condition of the Units. Todays devices are connected to the digital cloud. 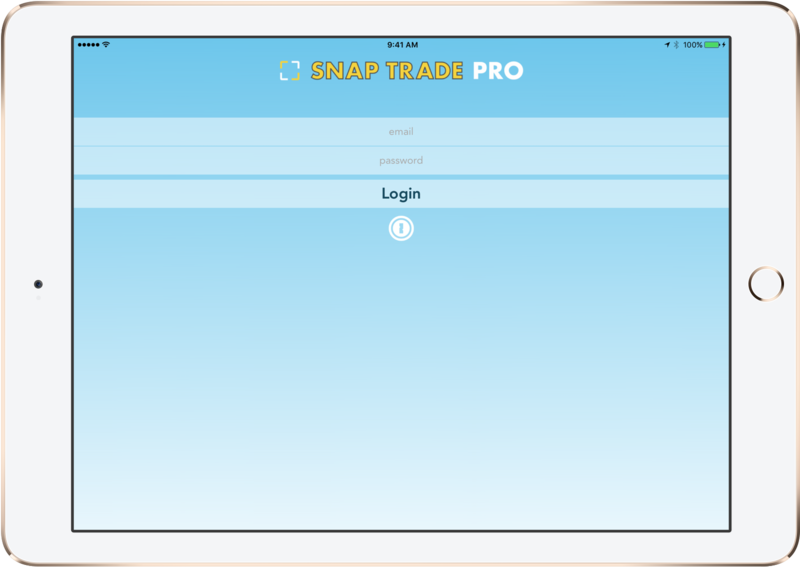 Snap Trade Pro uses those connections to push up and pull down your information from one secure location. Your data is available across your team through a web browser or native applications. Dealers are expanding the number of locations they manage. Manufacturers and Finance Co.s inventory Units across North America. Keep everyone that is selling your equipment up to date . It's like you are able to put everyone in the same room, even when you're not. No longer wait until everyone is back in the office to start working a deal! Enter details once and start the deal moving. Available on iPhone and iPad. these apps connect you to your organization's units. Create and update trade appraisals. Access inventory. Need support? Got requests? Contact us with in app messaging. Use the power of the mobile browser to get in depth with your deals. Review past, current and potential inventory. Manage appraisals & inspections. "When I'm out selling I need to know what's available now, what's on order and what we may be taking in trade or is coming in off lease. Customers expect me to know what we can sell them." "Trade valuations should be in the hands of our Sales Reps within 24 hours of a proper request. We have a number of people in the decision process. Getting the info to everyone across multiple locations is delaying the sale"
"On any given day we have potential trades, lease returns and outside packages that I want to put values on. So much of my time is taken up chasing information and organizing data from emails. There has to be a better way!" "As a new sales rep the internal process is quite confusing. So many forms, tasks to get done and people to involve. I'm constantly having to check with others"
"We shouldn't rely on having to ask for inventory commitments. We could use a central report to view potential trades and inventory on order. That would help us manage our wholesale funding"
"We have multiple locations and any number of desks or briefcases where that info could be found. I know it needs to be available across the team but I need it to help someone right now!" Manufacturers & Finance Companies can solve similar problems for Factory Inventory, Lease Returns and Repossessions. 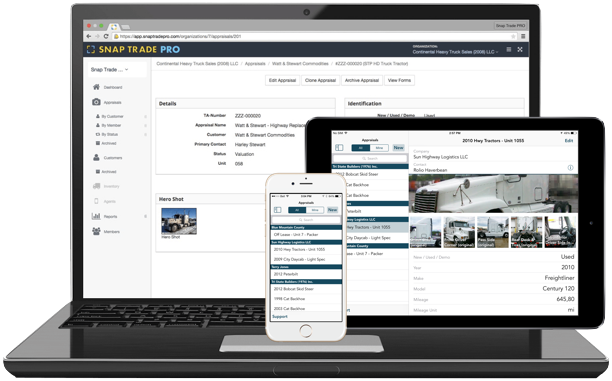 Connect Snap Trade Pro with your dealers to manage the process of getting inventory assessed, reconditioned and sold.